I have always loved this building. It was once a house that was transformed into a business (as it was directly on Paramount Blvd.). 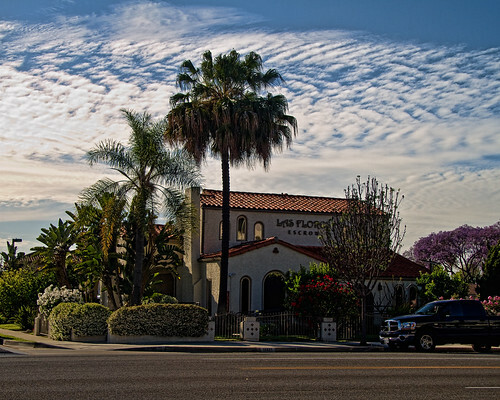 It is a beautiful adobe style surrounded by enough plants and color to make it look appealing, very mission-style. Beautiful! I've always loved this "house" as well, and now I have a renewed appreciation of the whole mission-style adobe. Thanks for the reminder. Great picture -- if I didn't know better, I'd think it stood alone, rather than on a city block with houses all around. Great picture. It's all so beautiful, especially all the mature plants.